WIN a Harry Potter Advent Calendar - Filled with Jewellery ! It’s no secret that I am a huge Harry Potter fan. When a friend tagged me on Facebook over the weekend to share this Harry Potter Advent Calendar with me, I threw on some clothes, loaded the kids in the car and set off on a mission to acquire two of them… one for my daughter, and one for one of my lucky blog readers! What is this Harry Potter Advent Calendar? From the front, it looks much like any chocolate advent calendar you’ll find on Supermarket shelves throughout November. There’s a cute image on the front, along with numbers 1-25 printed on individual windows. Inside this Harry Potter Advent Calendar you will find: One silver charm bracelet behind window one, and then 24 days of complete surprises. The calendar features items from Gryffindor, Slytherin, Ravenclaw or Hufflepuff, so you’ll find plenty to keep you happy over the course of December! There’s 9 rings, 3 beads, 12 charms and 1 bracelet hidden behind the windows. An amazing array of costume jewellery for any Harry Potter fan – I think you’ll agree? This Harry Potter Advent Calendar has an RRP of £15 and is exclusively available instore at Asda. The pieces are costume jewellery, but they look like brilliant quality. Hufflepuff Queen has already unboxed it over on her channel! Several of my local and indeed online friends have been unsuccessful in getting hold of one over the weekend. With that in mind, I have decided to spread a little festive cheer and give mine away! (My daughter has one, so I will still get to experience the amazingness within – don’t worry)! To be in with a chance of winning this Harry Potter Advent Calendar, comment below telling me which Hogwarts House you’d most like to be sorted into and why. Make sure you fill in the gleam form, too! 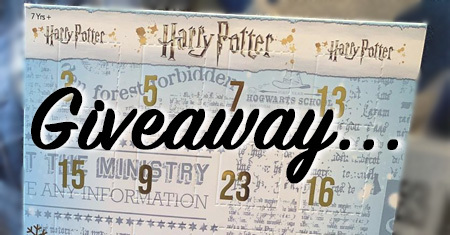 FYI: The Harry Potter Advent Calendar giveaway will end on Tuesday 20th November. The winner will be drawn and notified by email within 48 hours. You will then have 48 hours to accept your prize, before it will be forfeited and another winner will be drawn. Please note, this giveaway is for UK residents only. The prize will be dispatched via recorded delivery within 2 working days of the prize being claimed by the winner. Good Luck! You can find more Harry Potter inspired blog posts here. Finally: Don’t forget to share with all of your Harry Potter loving friends! I always wanted to be Gryffindor but then I was sorted into Hufflepuff and everyone told me oh yes that’s just right for you – so I have to admit over the years I’ve become to love Hufflepuff and their badger. Definitely ravenclaw, I took the pottermoore quiz and everyone tells me how intelligent I am. So excited when I saw this was up for grabs! I am a Slytherin. I have tried being a goody two shoes, but I just can’t do it. This would be perfect, I’m a huge Harry Potter fan, I’ve grown up with it. And I can’t have chocolate advents so this is GREAT. Ooh, daughter would love this! I had no idea this had been brought out! It’s made my day! Thank you! I didn’t know about these! My girls are Gryffindors, but I’m a wise Ravenclaw. A girlie swot through and through! I’d hope to be sorted into Ravenclaw because of my creative streak. Ravenclaw! Without a doubt! All those books 😀 plus They’re also in a tower! These calendars look amazing <3 I'm a Slytherin through and through, Resourceful, ambitious and loyal to our own! Definitely Hufflepuff, they’re so relaxed. Wowzers! One of the best advent calendars I’ve seen this year! I’ve taken the test about 4 times and been sorted into Ravenclaw on every occasion! I’ve bought a ton of Ravenclaw themed items including Luna’s wand. Would love to win this! I’m a griffindor fan but I was sorted into hufflepuff, I have to admit it does suit me better. What a great giveaway, fingers crossed. I want to be in Ravenclaw, because I love Luna Lovegood! Ravenclaw, they’re too cool and intimidating. Hufflepuff! They are loyal and have Newt Scamander! Oh and my house would be Hufflepuff! It would be Hufflepuff for me. I really wanted to be Gryffindor and I did the test on Pottermore and I am! Dead happy! It would have to be Slytherin as the name alone sounds mysterious! I am a mysterious soul! This calender looks amazing! My eldest daughter Sophia would love me forever if I were to give her this for her advent this year! Crossing my fingers! Thank you! Slytherin as im naughty !! I’d like to be a baddie for once and be in Slytherin. Slytherin because I’m a bit naughty and cheeky. Hufflepuff for me though the kids would disown me! I think we all want to be a Gryffindor but I think I’m probably more suited to Hufflepuff!! I’d like to say Gryffindor but my wife probably would say Hufflepuff (she’s right to be fair). I’d love to be sorted into Ravenvlaw as they’re very curious and they read a lot (that’s me really, a nosey bookworm ) good luck everyone. Hufflepuff because I believe in fair-play! Hufflepuff! I have an affinity for herbology and plants… I’m not a duffer but my common sense would apparently exclude me from Gryffindor, I don’t value academia enough to qualify for Ravenclaw and I’m not ambitious or ruthless enough for Slytherin! This is an awesome advent calendar! Thank you for making me aware of it. Gryffindor, I fight for others and put them before myself. Plus the badge is awesome!! I am a HUGE fan of Harry Potter but then i suppose everyone is. I have a harry potter room and this would look great in it! I am trying to collect all the fantastic beasts pops. I think for me it would have to be Gryffindor as i think i would fit in perfectly with the people already in that house. I would be Hufflepuff because I am basically nice but not brave enough to be Gryffindor! I’m proud to be a Ravenclaw and think I’d fit right in with it! Ravenclaw for me! Good at exams! Ravenclaw, love to be creative so would fit in well. Gryffindor – the house with all the heroes in it! Hufflepuff – loyal till the end! I’d like to think I’d be Gryffindor but not sure I’d make it. It just seems like a cool house – after all Harry Potter is in it! I think I’d end up in Ravenclaw. I’m not really sure why! Hufflepuff. The name just sounds great. Ravenclaw – if the hat fits! My kids would absolutely love this! A brilliant advent calendar to rival anything made of chocolate. I’d be Ravenclaw – creative, quirky and good at solving puzzles. My husband says I’m Ravenclaw as he sorted everybody else and Ravenclaw was left over 🙂 I am pretty good at trivial pursuit so he may be correct.